The last time I was in Paris, Yann Arthus-Bertrand had an amazing outdoor aerial photography exhibition titled Earth from Above. 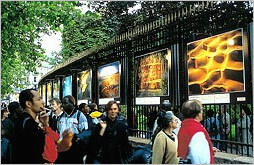 His poster-sized prints lined park fences and featured thought-provoking subjects. But what really struck me was the exquisite color combinations that materialize when you view Earth from above. Arthus-Bertrand’s images are the best kind of inspiration and his online gallery has recently been redesigned. There are hundreds of color combinations for designers to explore.